This photograph was taken about 1950. 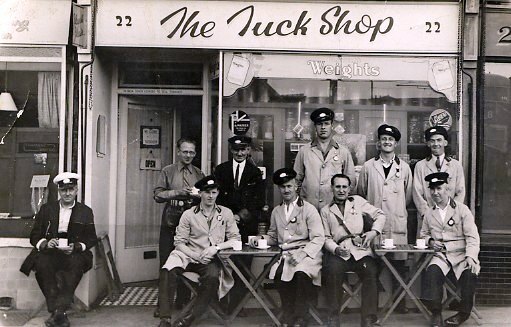 My father Stanley Middleton is the tall man in the back row with the cafe owner and other drivers and inspectors. The cafe is on Whitehawk Road just north of the bus depot and the Whitehawk Inn. My earliest memories of the depot are sitting on dad’s lap aged about 4, when he was driving the Trolley Bus into the depot for the night. Dad later had his knee fused straight so he could not drive. It was the result of an injury with a field gun when he was a pre-war soldier in the Royal Horse Artillery. He also drove for the other coach companies including Alpha and with Bill Simmonds used to tout for business on the seafront near the Pier. His speciality was the “Mystery Tour”. Our family lived in a prefab in Ticehurst Road next to the Goddens. Do you remember the Tuck Shop? What about their menu? Any of the gentlemen here familiar to you. If you can help, please leave a comment below. The Tuck shop was in Whitehawk Road opposite the Brighton Hove and district bus depot, not the Broadway. There was a cafe in the Broadway run by Stan?, where we teens hung around. The drivers look like day tripper drivers, and has been said Mystery Tour drivers. In the summer there was a line of coaches along the seafront with boards outside and the promise of the trip of a lifetime around the local countryside ending up in a boozer and back again to the seafront and hopefully giving the drivers a good tip, probably the more the trippers had supped the bigger the tip. There was a big coach park further on from The Broadway where the drivers would park up. The Alpha Coach Garage was in Bristol Gardens opposite Princes Terrace. The number 44 and 44A buses on the French Convalescence Home to Seven Dials route would stop at the depot on the way back from the Dials for the call of nature and also to pick up a billy can of tea which was always ready for them. They would then go to the end of the route at The French Convalescence Home and have their ten minute break and a cuppa. Then back on route to the Seven Dials where the bus would stop momentary outside the cafe where the conductor would scurry in and hand over said billy can, and then on their way back again to Seven Dials. My childhood days all over again. I remember The Tuck Shop on Whitehawk Road, I often called in for a 4d glass of Tizer after coming back from a kick about with my mates over East Brighton Park in the mid 1960’s. I also remember the Broadway Cafe ran by Stan Miller as Mick Peirson mentions, spent many a good time in there around 1969 -71 playing pinball and table football before graduating to the Whitehawk Inn, lovely memories. I worked as a Brighton, Hove & District bus conductor during 1968, prior to going off to university. When working Service 1, which terminated in upper Whitehawk, I’d jump off the bus as it pulled in briefly outside this cafe and collect a billycan of tea and a couple of cups. We’d then continue to the terminus, down the tea during our stand time, and return the can and cups when passing the cafe on the outward journey. The cafe was also much frequented by crews on standby at Whitehawk Garage opposite. I’m Pauline Godden and had 2 older brothers Lesley and Ian. My mum and dad were Charlie and May: my dad worked for the Coop. From the prefabs I only remember the Middletons but we left there when I was 4/5 years old. I have memories of living there but can’t remember any other names.